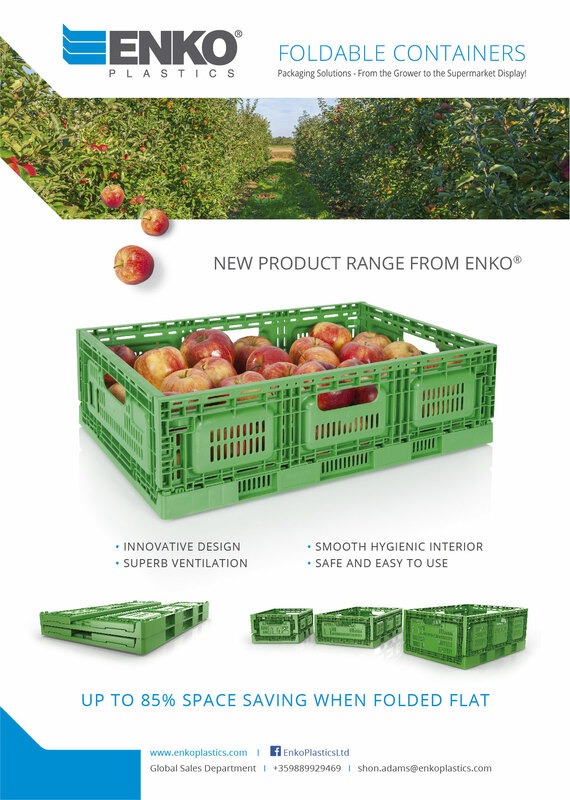 ENKO® Foldable Containers are the most efficient transit packaging solution from the growers to the supermarket display. Designed in the U.K. in accordance with the latest market trends and European safety standards, they feature sturdy construction, smooth inside surface, ergonomic handles and rounded edges - all to ensure maximum produce protection and safe transportation and handling! Superior ventilation on the base sides enables faster cooling and better temperature control during transit and storage. They are suitable to use in chilled and humidified environments (temp range from -15°C to +90°C) as well as in facilities with automated system lines. The standardized base footprint (600x400mm and 400x300mm) ensures secure stacking on top of most Euro-sized and bail-arm containers. The easy ‘click-in’ folding system allows for fast and safe folding and unfolding both manually and by automated lines. The containers are equipped with card and label placement holders and are designed to allow multiple branding options, RFID and Bar code identification. 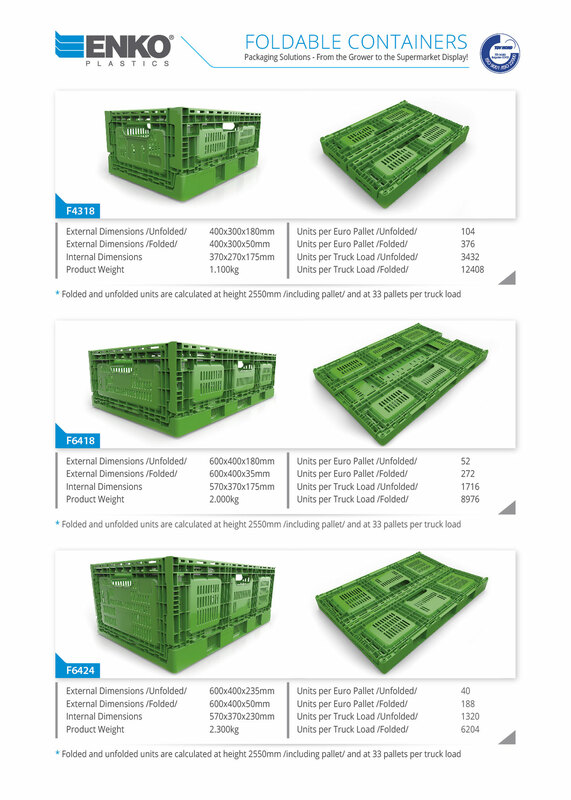 When folded flat ENKO® Foldable Containers provide up to 85% of space savings, which is great for return transport and storage when empty. They are a sustainable reusable packaging solution, suitable for numerous return trips, which means no waste disposal at the food retailer site. They are produced from 100% food grade materials and are fully recyclable. We have gone even a step further to extend our product life cycle by incorporating a “repair” feature. ENKO® Foldable Containers can be easily taken apart and the unserviceable parts can be replaced with new ones, so they can continue serving our customers in the most efficient and cost-effective ways possible!